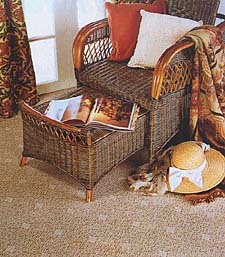 design inspire by William Morris. Given the pace of life today, it is easy to forget the skill and care that craftsmen still lavish on quality and fitness for purpose. Textiles are up there with the best, and Axminster carpets in particular have lost none of the quality associations we have come to expect. Still made in the town which gave its name to this particular type of construction over two centuries ago, Axminsters from Axminster are here to stay. Thomas Whitty started his manufacturing company in 1755 to provide the gentry with hand knotted carpets of a quality and at a price at which even the imported rugs from the middle east could not compete. Whitty supplied the Brighton Pavilion, Carlton House and even the Sultan of Turkey with superb examples of the carpet makers craft. 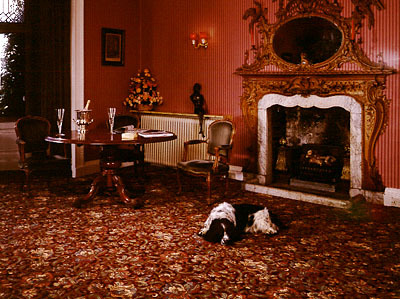 The tradition is carried on with Axminster Carpets from Devon gracing many prestigious buildings around the world, including sumptuous hotels such as Number One Nob Hill in San Francisco, Casinos along the French Riviera, the Royal Albert Hall in London and the recently refurbished Windsor Castle. But what is it that attracts the most discerning contract carpet specifiers as well as those of us that merely want the best for our home? Every Axminster carpet starts in the company's own spinning mill in Buckfast where Axminster wool buyers select the UK's finest grade of wool to blend with superior fleece from Axminster's own flock of Drysdale sheep. This ensures maximum strength and hard wear with exceptional whiteness and resilience. The fibre is then washed and spun into yarns ready for dying and weaving into carpet. The advantage of the Axminster weave is the large number of colours that can be used in intricate designs without wasting yarn. This results in patterns of great depth and subtlety and Axminster's design team have been responsible for the company winning many awards from leading retail groups for their best selling ranges. As anyone at Axminster is quick to point out, a patterned woolrich carpet is the most practical flooring choice available today, it rarely shows spots, spills and everyday wear and is specified for many public buildings for these reasons as well as safety and comfort. Wool resists cigarette burns and does not readily support combustion plus, it is less prone to static and can tolerate a high moisture content without feeling wet. It is an all round carpet fibre and is Axminster Carpets' first choice, making the company the leading manufacturer of 100% woven wool carpets in the UK. 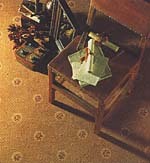 Axminster Carpets have enjoyed a reputation for design excellence and this is evident in their latest range of patterns. Royal Axminster has been inspired by the great William Morris, who in 1862 founded his own firm for the manufacture of furniture, wallpaper and fabrics. The Morris influence underpinned the Arts and Crafts movement, which segued into the Art Nouveau style, all of which are undergoing a popular revival. Royal Seaton meets the demand for small motifs while the traditional Turkey design in Tamar enjoys a new green interpretation. 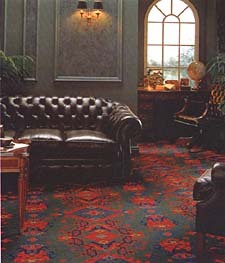 Axminster Carpets are still ahead of the trends.